13 May 2007: Conceived in the 1860s as a monument to Philadelphia’s industrial might, Philadelphia City Hall was better known for much of its history as a monument to corruption and excess instead. Intended to be the world’s tallest structure when construction began in 1871, it had been eclipsed by the Washington Monument and the Eiffel Tower by the time it was completed thirty years later. On at least two separate occasions in the 20th century, proposals to demolish it were seriously considered. Now, more than a century after its completion, it stands as a beloved landmark, the symbolic and literal heart of a great American metropolis, placed astride the intersection of its two principal streets, Broad and Market. 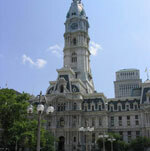 Philadelphia City Hall remains today the tallest occupied masonry building in the world, and with more interior space than the U.S. Capitol, it is also one of the largest municipal buildings in the United States and the world. Designed by Philadelphia architect John McArthur, the building is considered one of the finest examples of French Second Empire architecture in the United States, with a mansard-roofed three-story façade that disguises its eight-story bulk. City Hall occupies the central square of the five laid out by William Penn, which was designated as the site of buildings for “public concerns” in his original city plan of 1682. For most of the city’s first 150 years, the space was occupied by farms as growth occurred close to the Delaware River. Public business was conducted in the complex of buildings on Chestnut Street that included the old State House, now known as Independence Hall. After the consolidation of the City and County of Philadelphia in 1854, local leaders realized that a larger structure was needed to house the city government and courts. After an uproar over a city proposal to build a new city hall on Independence Square scuttled that idea, the Commonwealth of Pennsylvania created a “Commission for the Erection of Public Buildings” in 1870, charged with the construction of the new City Hall. City voters chose Center Square as the site of the new structure in a referendum later that year. The project was mired in controversy from its start, with the city government continually shortchanging the commission’s requests for construction funds while the legendary political machine of Boies Penrose attempted to take control of the project from the state. (As Penrose never succeeded, City Hall’s early reputation as a monument to corruption was perhaps undeserved.) The advent of electricity and the invention of the elevator while the building was under construction also necessitated costly retrofitting projects. In the end, City Hall cost $24 million to complete (about $2.5 billion at 2005 wage rates), making it the most expensive government building ever built in the United States. The building’s ornate, richly decorated style, already out of sync with Philadelphia’s traditional architectural modesty, had fallen out of fashion by the time of its completion. Noted local architect Paul Phillippe Cret proposed knocking down all but its tower, which would be remodeled into an Art Deco structure, in the 1920s. The even larger sum it would have cost to demolish and replace the building spared it from the wrecker’s ball both then and again in the 1950s. Since the 1970s, a growing appreciation for the building’s architecture and history has led to an ongoing program of renewal. A series of projects begun in 1988 with the rehabilitation of City Hall Tower have slowly restored the building’s exterior. As of 2007, the restoration project has worked its way around three-quarters of the building, and new lights installed on surrounding buildings in 2005 make it sparkle at night. When the American Institute of Architects asked architects and the American public to name their favorite buildings to commemorate its 150th anniversary this year, Philadelphia City Hall ranked 21st on the final list of America’s 150 favorite buildings. It was the highest-ranked municipal building in the country and the highest-ranked of all buildings in Philadelphia on the list, as well as the fourth-favorite government building after the White House, the U.S. Capitol and the U.S. Supreme Court. In addition to housing the mayor, the City Council, and the heads of most major city departments, City Hall also houses chambers of the Supreme Court of Pennsylvania and the civil division of the Philadelphia Court of Common Pleas. It had also housed the criminal courts until a new Criminal Justice Center was built to its northeast in 2002. Much of the city bureaucracy is housed in the Municipal Services Building, a modernist structure to its north, completed in 1965. The building is graced with 250 works of sculpture, from great ones like the 37-foot-tall statue of Penn atop its towerthe tallest sculpture on any building anywhereto humorous flourishes like the cat-and-mouse motif found in the building’s south portal. All were the work of Philadelphian Alexander Milne Calder, the first of a three-generation line of sculptors that ended with mobile creator Alexander Calder. (A trip up the Benjamin Franklin Parkway from City Hall to the Philadelphia Museum of Art takes the visitor past works by all three Calders, including the Swann Fountain in Logan Circle, by the middle Calder, Alexander Stirling.) Other distinctive architectural features include the cantilevered “flying staircases” in the building’s corner towers and the elaborate Conversation Hall, on the second floor near the mayor’s office, a popular spot for official ceremonies and receptions. For most of its history, City Hall was the tallest building in Philadelphia, thanks to an unwritten “gentlemen’s agreement” that limited building heights to the 549-foot-high brim of William Penn’s hat. Even though that agreement was broken in 1987, the free observation deck at the base of the Penn statue remains the best vantage point from which to view the city. Sandy Smith is a public relations professional and freelance writer/editor living in Philadelphia, Pennsylvania. He has written news stories and essays on architecture, transportation, city life, politics, and popular culture for The Philadelphia Inquirer, the Philadelphia CityPaper, and community weeklies in Philadelphia and Boston. He is currently Writer/Reporter in the Public Relations Department of Widener University, a private university located in Chester, Pa., about 10 miles southwest of Philadelphia City Hall. A native of Kansas City, Missouri, and a 1982 graduate of Harvard University, Smith also contributes to the ongoing conversation about life in Philadelphia on Phillyblog.com and chats about food on eGullet.org.